Since Thanksgiving is also about family, here’s a blogpost from 2014 about one of *my* family members… Have a wonderful holiday, everyone! With Thanksgiving just a few days away, it seems a fitting time to share with you that I happen to be “of the house and lineage” of the first pilgrims who sailed to America on the Mayflower in 1620, establishing both Plymouth Colony and the first Thanksgiving feast. Granted, there are a fair number of New Englanders who can claim that genealogy – in fact, in the same manner that it’s assumed that everybody’s Irish on St. Patrick’s Day, I suspect that it might also be said that on Thanksgiving we’re all pilgrims (!) 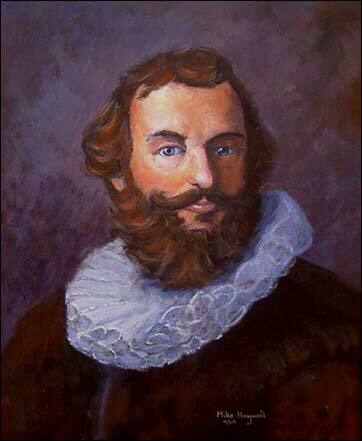 – however, our family can justifiably take pride in a family tree that reveals that our particular ancestor was none other than Captain Miles Standish, famous in the Thanksgiving story as the military leader of the Pilgrims.